I mixed this all together then baked at 180 degrees and fully expected nice big yummy cupcakes. They looked lovely in the oven but when they cooled they sank and had little peaks in the middle – looked like little volcanic mountains without the hole on top. So what went wrong? Was it the recipe, the baking temperature, my very old over or just me? I would love to hear your suggestions or even a better recipe. 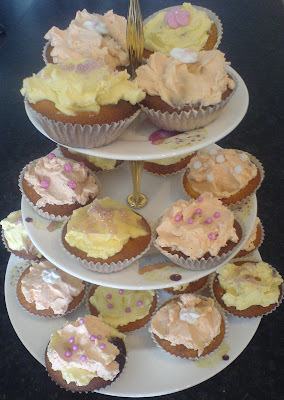 One of my favourite cupcakes recipes is this one from the BBC website. Happy Saturday, have fun making cupcakes – oh, and if you have any recipes for cupcakes without sugar please leave the recipe in the comment box below. ok well i am gonna try this tmrw and c how they come out – my cakes always end up a little ..hmmmmm whats the word…..dry!!! More importantly how did they taste?? they r gorgeous so will bake a batch and bring on thurs maybe?